The most prominent attribute of N’Gage I really like is the fact that it doesn’t contain any unwanted ingredients that you can find in most of its pre-workout counterparts like dyes, stimulants, carbohydrates and sugars. This one only packs the stuff you need to take on your workouts longer and harder so you can achieve the results that you’ve always wanted much quicker. I give this one the green light. The energy levels you’ve got before taking on your workout routine can easily make or break your chances of achieving the goals in your bodybuilding checklist. Not having enough will only make you do poorly when you hit the gym, which will just lead to less than ideal results even if you’ve got the best training program in your arsenal. This is the biggest reason why you need to get your hands on a reliable pre-workout to fire you up. And N’Gage claims that it should be on your shortlist of supplements if you’re looking to really take your workouts to a whole new level. We will give this pre-workout supplement a more comprehensive look in a bit to see if this one is worth giving a shot when sculpting your ideal physique is concerned. A product of Axis Labs, N’Gage is formulated to ideally perk up your body to its full potential so you can easily brave even the most punishing workout routine. Apart from optimizing your energy and endurance levels, this pre-workout is also designed to take your muscle performance, blood flow and mental focus up a notch while at it. The higher the intensity of your workouts are each time you hit the gym, the easier it will be for you to achieve your bodybuilding goals in a much shorter period of time like blasting away unwanted fat as well as achieving serious lean muscle mass. N’Gage comes in four (4) different flavors, particularly Cherry Limewave, Glacier Punch, Orange Cream and Watermelon. Editor’s Tip: Check out ALPHACre HD for an even better option. What are the Ingredients of N’Gage? 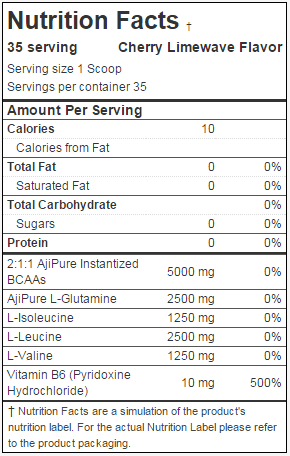 AjiPure Instantized BCAA’s – or short for branched-chain amino acids – are basically composed of L-Valine, L-Isoleucine and L-Leucine, which are scientifically classified as essential amino acids that make up a significant portion of the body’s skeletal muscle tissue and the main components of protein that serve as the primary energy source for muscles. Moreover, BCAA’s are also seen to help control the appetite, bring down cortisol levels, improve the production of growth hormone (GH) levels, reduce muscle fatigue and soreness after intense physical activity as well as enhance overall recovery. AjiPure L-Glutamine may be one of the most common amino acids found in the body, but plays a very important role in lean muscle growth and development like transporting nitrogen to the muscle cells, preventing catabolism, initiating cell volumizing and the ideal metabolism of proteins. However, glutamine also gets depleted quickly when you engage in challenging workouts regularly. You won’t feel and experience its benefits if you don’t keep its levels ideal in the body. What is the Recommended Dosage of N’Gage? As a dietary supplement, mix one (1) scoop of N'Gage with 8-10 oz of water. Consume a single serving within 30 minutes following your workout. N'Gage can also be consumed as a mid-day anabolic boost. Does Using N’Gage Have Possible Side Effects? Based on the information that I have come across while researching for this review, I learned that the users who have already tried N'Gage did not experience any adverse side effects at all. However, the manufacturers of this pre-workout supplement strongly recommend that people who have any allergies to soy, pregnant or nursing should not use it. What are the Benefits of N’Gage? What are People Saying About N’Gage? So Should You Try N’Gage?